예제에 보면 1 이 등록된 것을 볼 수 있다. 하지만!! ㅡ_-);; 그대로 따라해보면 저렇게 오류를 뱉는다. 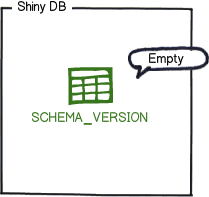 * Sets the version to tag an existing schema with when executing baseline. * @deprecated Use setBaselineVersion() instead. 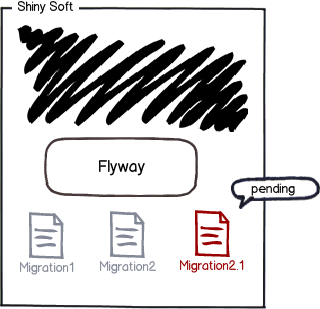 Will be removed in Flyway 4.0. 에서 보는 것처럼, 1, 2, 3으로 정의하던 initVersion 관련 항목이 @Depercated 처리되었다. flyway의 릴리즈 노트를 보면 init 관련항목들이 baseline으로 변경된 것을 확인할 수 있었다. 두둥. Issue 860 Deprecated init(), use baseline() instead. Issue 860 Deprecated initVersion, use baselineVersion instead. Issue 860 Deprecated initDescription, use baselineDescription instead. Issue 860 Deprecated initOnMigrate, use baselineOnMigrate instead. Issue 860 Deprecated FlywayCallback.beforeInit(), use FlywayCallback.beforeBaseline() instead. Issue 860 Deprecated FlywayCallback.afterInit(), use FlywayCallback.afterBaseline() instead. Issue 860 Deprecated MigrationState.PREINIT, use MigrationState.BELOW_BASELINE instead. Issue 860 Deprecated MigrationType.INIT, use MigrationType.BASELINE instead. 스프링부트에서 사용한 외부 라이브러리에서 오류가 발생한다면, 외부라이브러리와 관련된 가이드를 살펴보자. 스프링부트 레퍼런스 가이드에 반영이 안되어 있을수도 있다.